"The 7'9" Malibu is a great balance between stability and maneuverability, the volume of the board lets you to catch any wave you paddle for. The board is short enough to perform sharper turns than the classic log whilst still allowing for those long nose rides." Possessing the stability and ease of a longboard with integral design elements of a quick-turning shortboard, the Performer offers you the chance to pump up your surfing technique while decreasing your board length. Able to embrace a wide range of wave conditions, it offers heaps of fun and a versatile ride through its tested, refined and proven shape. A board that is super fun to surf, rapid and precise, giving a real spring under foot. Thanks to the board's elongated pin-tail you can really drive off the bottom turn and start to attack good waves, right in the critical section. You can also surf "old school" as this board is the perfect transition between the stability and ease of a longboard, and the rapidity and tight carves of a shortboard. 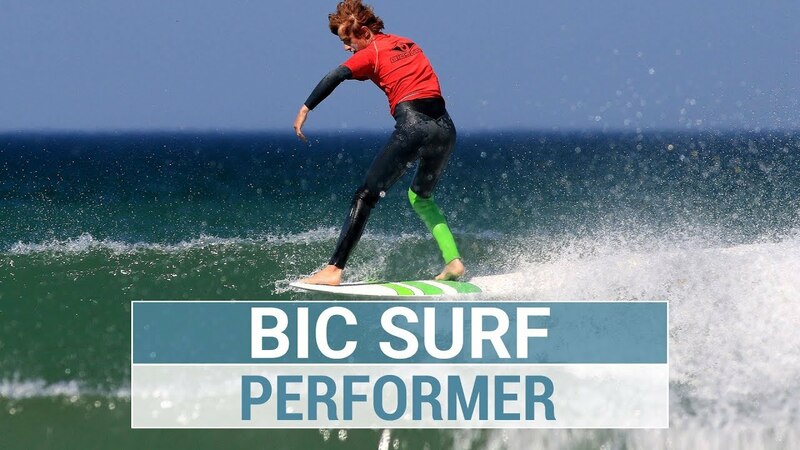 Construction Technique: Over the past few years Bic have refined their ACE-TEC technology for SUP, Surf and Windsurf boards. This unique technology suits the needs of experienced riders and newbies alike with a unique combination of LIGHT WEIGHT, DURABILITY AND PERFORMANCE at a great price. 1/ Molded, Lightweight and watertight 15 kg/m3 EPS Foam Core. 2/ Fiberglass reinforcement for improved stiffness and performance. 3/ ASA Polymer outer skin for unmatched durability and impact resistance. 4/ Embossed EVA foam pad for maximum comfort. 5/ Molded external inserts – no penetrations through outer shell and maximum strength.